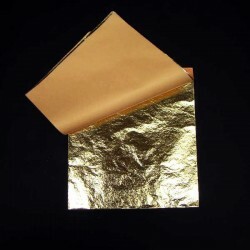 Buy Imitation Gold - Brass Leaf for sale here. Composition or Imitation Gold Leaf. Color 2 1/2(Loose/Surface)Composition Gold Leaf, also referred to as Dutch Metal and Schlagmetal, is imitation gold leaf made from brass, a combination of copper and zinc.85% Copper & 15% Zinc Average gold color imitating 22kt genuine gold leaf, #2½ is the most popular color.The copper alloy in metal leaf will tarnish, therefore all metal leaf must be sealed to prevent tarnishing.Sold by the Book or the PackBooks contain 25 Leaves 5-1/2" x 5-1/2"Pack contains 20 Books or 500 Leaves. Average Coverage area for a book is 5.25 square fee. tAverage Coverage area for a pack is 105 square feet.